The Star of Bethnal Green | Pub Quizzers | Find a pub quiz near you, now. 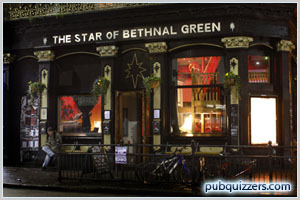 Pub quizzes take place at The Star of Bethnal Green, Bethnal Green on Tuesdays (weekly) at 20:00. Entry is £2.00, you can have up to 8 people on a team. There are prizes of cash, drinks, food. Happy quizzing! Popular pub quiz, it's streamed live to various other pubs around the UK. Top prize is up to £100, and booze. There are chocolates for 2nd place. There is a pot noodle for last place.